Reason #76: Why Were The Children Absent? On hearing the shocking news of sudden the demise of Syedna Mohammed Burhanuddin RA, mumineen from around the world instantly flocked to Mumbai in the thousands. Business owners, Employees, Doctors, Teachers and other professionals dropped everything at a blink of an eye. Elderly people, and those suffering from various illnesses ignored their own selves for that instant. They were driven by the love of The Late Syedna RA, and with a fervent hope of participating in the funeral, janazah namaaz, dafan and Taziyat, come what may. Amoungst those who made it were those from Syedna’s RA own family. Many were in England and USA at the time and made it to Mumbai in a few hours. The news of Syedna’s demise spread around 12pm IST on Friday 17th January 2014. Many from the USA booked tickets and traveled instantly catching random connecting flights, and reached Mumbai within 24 hours (some even missed the burial). Khuzaima Qutbuddin made his statement public within 24 hours, around Saturday 18th January 2014. He sent a letter to Syedna Mufaddal Saifuddin TUS and Syedi Mukasir Bhai Saheb stating his demands. It is interesting to note that Khuzaima Qutbuddin’s own children including his learned daughter Bazat Tahera Qutbuddin and Taher Qutbuddin, whom were both in USA at the time, did not travel to Mumbai. Syedna Mufaddal Saifuddin lead the Namaz around 24 hours later, surely they couldn’t have known what the future held for them. If they hoped their father’s demands would be met they should have at least started their journey from USA to Mumbai as soon as they received the sad news. Even if they knew they would be ‘deprived’ of their ‘rights’, they could have been in Mumbai and continuously tried their best to make it happen. As a father and supposed Mansoos, Khuzaima Qutbuddin should have forced his children to be present at this heart breaking time. Did he not think it was necessary? Did they not love Syedna Mohammed Burhanuddin RA enough? Is this what a ‘mother’ wishes at their ‘father’s’ funeral? Were they not drawn by the love and memory of Syedna Mohammed Burhanuddin RA, just like others from Syedna’s family were? Did they not wish to be present at the namaaz and dafan? Even if they couldn’t reach in time, did they not at least want to do ziyarat of their beloved Moula RA, and participate in taziyat and Khatm al Quran majaalis (as many who were aware they would miss the Janazah travelled despite knowing this)? This is the least a family member would do let alone one who claims that his/her own father is the heir and successor. What could be their excuse? Surely it would not be financial constraints. Furthermore, a MS Word document named “White Paper Talking Points-1” was made viral through emails. This document was written by Tahera Qutbuddin in favour of Khuzaima Qutbuddin’s claim. 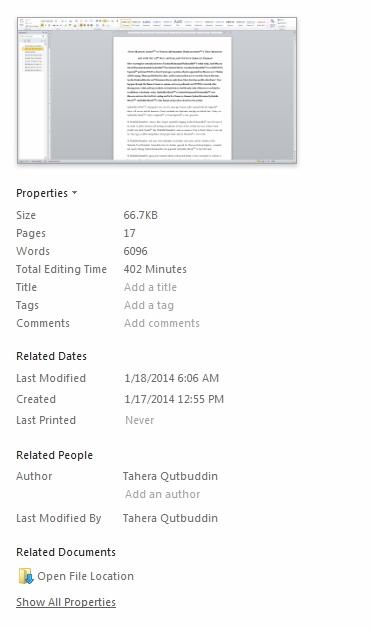 From the below screen shot of the document’s properties, it is clear that Tahera Qutbuddin created this document on 17 January 2014 at 12:55pm (it is most probably 12:55pm in USA; Time Zone unknown) and completed it on the 18th of January 2014. She was more busy in writing this document and spread her fitnat, than traveling to Mumbai to attend the funeral. What is the point of writing Marasiyas of Syedna Mohammed Burhanuddin RA when you never loved him or were there for him? Was this just a marketing stunt? Just as they were never there for Syedna RA during His lifetime, they ignored him and continue to do so after his demise. More so, by being present in USA, they were more concerned on spreading their fitnat and consolidating their weak power. This is the only reason they, and most of their followers never traveled to Mumbai. Jazakumullah , the ilmi work done here is logical, the proofs concrete and comments unbiased. The research appeals to the intellectual and the one aspiring to be so. May Allah and Maula tus remove the shadow of doubt …if any….from the minds of the weak and strengthen the belief of those who are steadfast.Ameen. After reading abt khuzaima i observe this. I m mother of two. My elder child is a girl and she is a normal child at birth where the younger one(boy) is immature child at birth and his physical growth is little slow. As a mother i observe that me and my family we pay more attention to our son because of his health reasons. Although we love them both equally but as son is very ziddi we show him more affection in all aspacts and our daughter understands is very well. Like we always appretiate him for something not very big and very common with other children of same age but just to motivate him we praise for him. I explain above coz as we know tht there are so many hikmats behind dai’ saying and doing , in my zaif aqal i thing with so many hikmats one reason could be the same as with me. Dawedaar was immature in his aqeeda and so many people observed personally that how much zidd and jalan he has. So like bawa shafique and lovingly maa both maulas always gave him more than deserve(or even can not dreams of)to motivate him toward daawat. Qutbuddin,s are اولاد عاق (disobedient child’s) .How its possible for them to attend janaza namaz ? As their prayers, fast, any act of religion is unacceptable before Allah ! They are kept away from this sacred rituals by Allah for their disobedience and عداوة of Our Moula throughout their life time like enemy of Moulatona Fatema (as) . There is no substitute to “Love” as Al Quran says so well ” Qul la as alokum ilayhe ajran mavaddata fil qurba”. Did Khuzaima forget this at the very time of Janazaah ? and what did his children do ? Oh they ignored it !! because they did not want to create “Love” but want to creat “:Fitna”.